Fantasy. Children's. Family Viewing. Animation. 01 Tara's Midnight Movies. 01 Nigel's Choice. 01 Dave W (Whisky) Faves. 01 Ade tastics. Hearing Impaired (DVD). Recommended. Rob Recommends. When Coraline's parents move to the back of beyond and bury themselves in their work their seriously bored daughter decides to go in search of her own entertainment. Coraline stumbles upon a small portal that introduces her to an alternative world where her mum and dad care and the shabbiness of her real existence has been transformed into a wonderous place of beauty and adventure, but perfect places can sometimes hide a dark secret, as our heroine soon begins to discover. 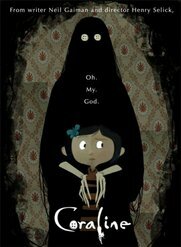 Directed and created by Henry Selick (A Nightmare Before Christmas) and adapted from Neil Gaiman's book, 'Coraline' is a visually stunning and gloriously imagined modern fairytale. One of those rare films that will probably leave the parents more awestruck than the kids; very dark and very good.